Originally, water-efficient irrigation systems were developed for homeowners in climate zones where drought was a persistent problem. Now we can create water-efficient landscaping in any climate and this concept has become increasingly important to our clients at Gardenworks. Our team of specialists create landscape designs and installations that produce twofold results: optimal landscape growth with efficient water. Our specialists also ensure that water conservation is a primary considerations in their designs. The water-efficient landscapes we create are also beautiful visually and we create a style that works in harmony with your property. We always tell our clients that the key to managing water use is balance — mixing the flowers, plants, and lawn areas of your property in a way that is both aesthetically and strategically attractive. We then create zones for these areas for proper water application and develop water budgets created to exclusively match and to avoid overwatering. Reduces your water use. 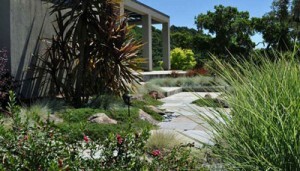 In California, nearly half of a homeowner’s water can be used in landscape areas. When you better manage your water use, your water bill will be less and you’ll feel good that you are conserving this costly and valuable resource. Requires less maintenance. When you add a water efficient irrigation system you will have less maintenance and your landscaping will need less chemicals, composting applications, and weed controls. When you use native or appropriate plants and use proper water application your property will have less insect pests and disease. Improves your property’s value. A water-efficient irrigation system is a value-added improvement that maintains your property’s plantings and in turn adds to its curb appeal. 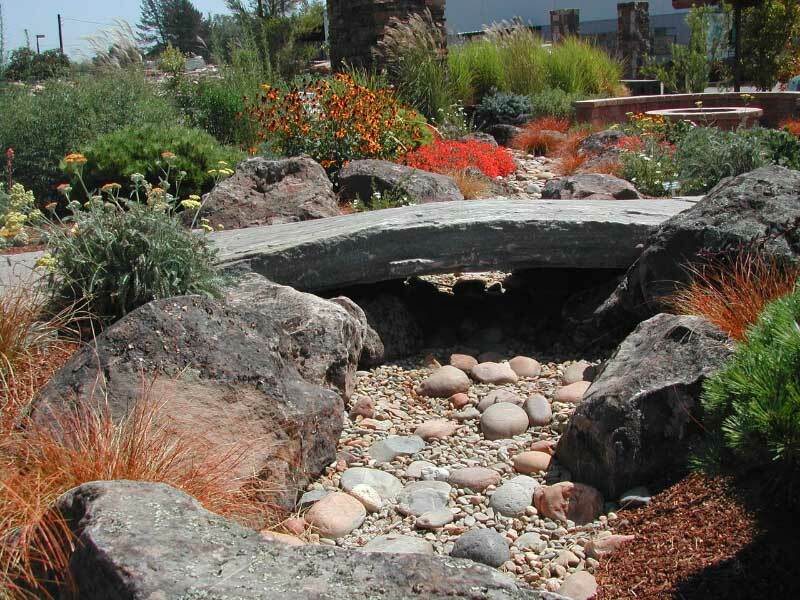 Design, Installation & Maintenance of Low Water Use Garden Overlooking the Russian River. If you’ve been thinking about making your landscape water efficient, we have two delightful examples of our projects in our portfolio: Water Wise Wine Country Garden, which you can see in the photo above, and this photo (left) from our Rio Lindo Retreat project. Contact Gardenworks Inc. today to find out how we can build a water-efficient irrigation system for your home.